The Homeoblock™ appliance is a revolutionary oral device that is much like a retainer in looks, but the results go way beyond teeth straightening. Furthermore it is currently the only orthodontic appliance for teeth straightening that is worn in the night time only. 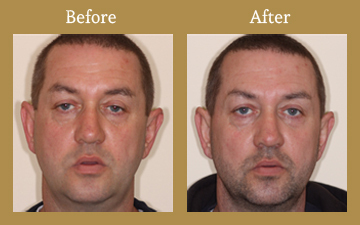 Before and after 12 months of Homeoblock therapy This patient had 12 months of homeblock treatment. His main complaint was that he always looked like he had 'had a stroke' and that he rarely slept more than a few hours a night. Notice how his eyes have opened and levelled out (as did his ears) and there is a general brightness to his face and skin. He now sleeps a 'good 8 hours every night'.